Q: What is intonation & why is it important? Intonation is accurately setting the pitch of intervals. For example, if the 5th string on a 6-string guitar is tuned to A-440 Hz, the frequency of the note one octave higher should be 880 Hz. If not, playing the guitar near the open position may sound in tune but elsewhere along the string will be out of tune and therefore sound bad. Q: What are Hollow Points® and what do they do? 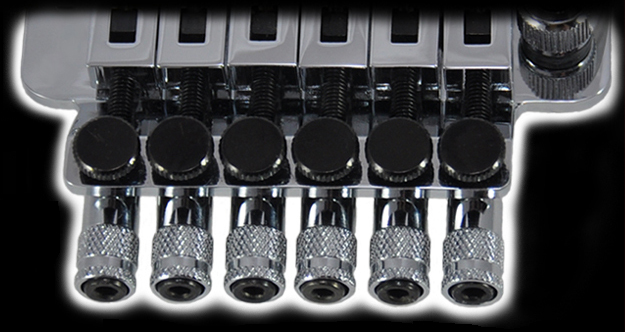 Hollow Points® are specially designed retro-fit parts for a double locking tremolo. When properly installed, Hollow Points® enable the user to set the intonation on double locking tremolos easily, accurately & quickly for less headache, faster set-up times, better sound, better tuning stability and better looks! Q: How are Hollow Points® installed? Installation of a set of Hollow Points® is easy & only takes about 8-10 minutes for first timers. Even though it is possible to install a set of Hollow Points® on a tremolo unit that is mounted on a guitar, the recommended method is to completely remove the tremolo from the body of the guitar. It is possible to re-use the existing strings or to complete the installation at the time of a string change. This more detailed method can take between 20-30 minuites for someone who is familiar with disassembling a double locking tremolo unit. No additional tools are necessary, just the standard hex drives commonly used for tremolo work. Installation is as simple as replacing all of the string lock screws! Completely removing the trem unit from the guitar will provide the optimum situation for visual verification that all parts are lining up correctly and checking the fit/mobility of moving parts. It will also greatly reduce the chance of cross-threading any of the machined parts or damaging the surface of the guitar. A good installation is crucial to the overall success & functionality otherwise this product very simply will work AGAINST you instead of FOR you!!! Using parts that are rusted, oxidized or lack freedom of mobility is not recommended and will prevent the tremolo – including the Hollow Points® – from functioning optimally. While the tremolo is off of the body, it is also a good idea to clean out any grime, dirt & dust build-up that bridges of this type are known for. Lubricating the threaded parts will also help minimize oxidation which can compromise the function and overall appearance of the tremolo. Q: What is the BLITZ Method®? The BLITZ Method® is a technique devised to maximize efficiency in setting the intonation on a trem unit that is equipped with a set of Hollow Points®. The overall objective here is that of saving time. Although there may be other ways of accomplishing the same goal, we recommend becoming comfortable with this technique first before putting an individual spin on the method. NOT FOLLOWING THIS METHOD COULD RESULT IN HAVING PARTS ‘LOCK UP’ OR BIND UNDER STRING TENSION. ANY METHOD MAY BE USED BUT START BY USING THIS ONE FIRST!!! Anytime adjustments are being made in string saddle position, LOOSEN STRING CLAMP SCREWS on the locking nut first. Q: Will I still be able to use a D-Tuna®? Q: Why buy the Hollow Point® Intonation System if I don't adjust my intonation regularly? The Hollow Point® Intonation System is not designed for you to be constantly intonating your instrument! From time to time, string intonation is a necessary adjustment. For instance, you may change the gauge of your strings from time to time. Or, did you know that sometimes even changing brands (of 9's or 10's, etc.) can cause a minor shift in intonation? You may never have had your intonation done, assuming it was set up correctly upon delivery to you. Maybe the person you imagined set the intonation correctly, well, didn't? Maybe you like being in charge of your own guitar, making sure it is as updated as possible with cutting edge technology! Maybe you were set back a bit, when offering your double locking trem guitar to the local repair shop to intonate and they told you a super high dollar figure due to the time it takes them to to properly intonate this type of trem? Or simply, maybe you knew the look of your old trem lacked something.... yeah, something like a set of exhaust pipes coming off the end of your guitar! Or how about the benefits of extra mass to each and every individual string? Whatever the reason, Hollow Points® are designed to offer you the satisfaction of giving your guitar the maximum experience that it can be! Q: Will Hollow Points® fit on any double locking tremolo? No. Even though a set of Hollow Points® will work on surface mounted tremolo units, Hollow Points® are best suited for recessed double locking tremolos where the fine tuners are vertically oriented and come into direct contact with a string lock screw. 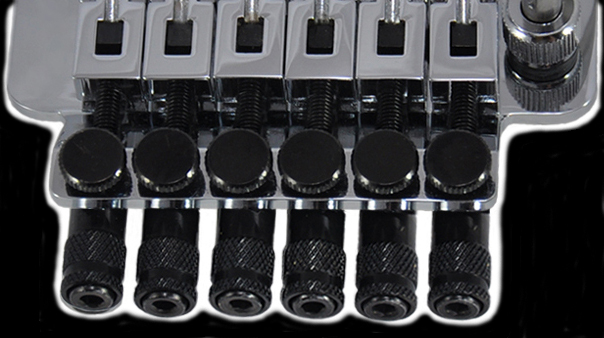 Hollow Points® will fit and work on most Floyd Rose® or Floyd Rose® Licensed Tremolos, as well as the Ibanez® Edge®. 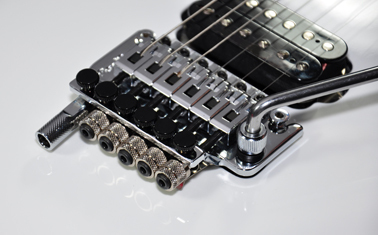 Q: Can Hollow Points® be used on the Ibanez® Edge® Tremolo? Yes! Hollow Points® will work perfectly on the Edge® Tremolo from Ibanez®! Q: Can Hollow Points® be used on the Ibanez® LO-PRO Edge® Tremolo? No. The Hollow Points® will NOT work with the Lo Pro Edge® Tremolo from Ibanez® in that the fine tuners are NOT in direct contact with the string lock screw. Q: Can Hollow Points® be installed on a low profile or recessed tremolo? Yes! Sometimes there is a confusion between a low or recessed profile bridge and a LO PRO Edge® tremolo as distributed by Ibanez® or the Floyd Rose® Pro. 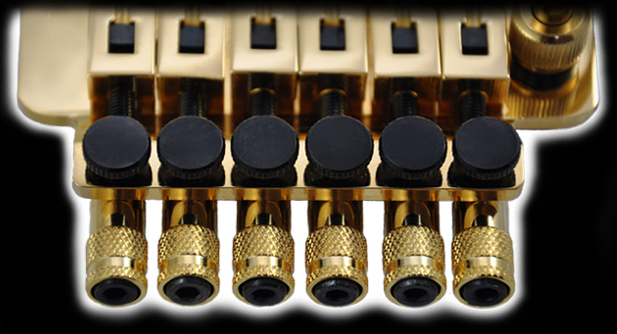 As indicated above, Hollow Points® will not work with these specifically designed trems, (and others like this design) as the fine tuners are NOT vertically oriented and do not come into direct contact with the string lock screw. Hollow Points® WILL however work with most LOW PROFILE or RECESSED Double Locking Trems! Q: Can Hollow Points® be installed on a recessed tremolo? Yes! No additional routing is necessary. Q: Can Hollow Points® be installed on my 7-String? Yes! In our Store, Simply buy one 6 String Set and add a matching color Single Hollow Point® to your shopping cart purchase! Q: Can Hollow Points® be installed on a lefty tremolo? Q: How much weight does a set of Hollow Points® add to the tremolo? Each Hollow Point® weighs right around 5 grams each so a set of 6 Hollow Points® will increase the weight by approximately 30 grams. Q: Will installing Hollow Points® affect the tone/sound of my guitar? Most people report improved tone and sustain by virtue of the increased mass to the tremolo unit. Solution: Make sure the Hollow Point® is zeroed out. This means confirming that the fine tuner is positioned midway between the vertical walls of the large groove of the Hollow Point®. If the fine tuner contacts either the front or rear wall of the groove, under string tension this may cause the fine tuner to bind – especially if the saddle mounting screw is not securely fastened. Solution 2: Loosen the Saddle Mounting Screws of the adjacent Saddle(s). What is happening here is there is a lot of play in lateral saddle position when all six Saddle Mounting Screws are loose but when tightened, the Saddles then become fixed in their positions. Consequently, any movement of the saddle toward or away from the nut does not take a direct linear path and the side walls of the saddle that is mobile are binding with its adjacent saddle(s) which are fixed. Once the adjustments are finalized, re-tighten all of the Saddle Mounting Screws that were loosened. Problem: Rotating the Fine Tuner Clockwise reaches a stop before reaching its fullest extent. Solution 1: This occurs most commonly on surface mounted (i.e. non-recessed) units and often is a result of the tension plate coming into contact with the surface of the guitar body. Loosen the string clamp screw at the nut and re-tune the string so the range of fine tuning coincides with the string being in tune. Solution 2: There may be too much pressure being exerted by the tension plate. Being that there is a wide variety of countries of origin for this type of bridge, there is a corresponding wide variety of tension plates in terms of size and pressure exerted on the string lock screw or Hollow Point®/String Lock Screw assembly. Occasionally pushing down on the Hollow Point® to “stretch” the tension plate will usually allow more range in fine tuning. Solution: Confirm that the Fine Tuner is engaging the large groove of the Hollow Point®. This could be happening because the Fine Tuner is not anchoring the Hollow Point® in position. Solution: There may be too much pressure being exerted by the tension plate. Being that there is a wide variety of countries of origin for this type of bridge, there is a corresponding wide variety of tension plates in terms of size and pressure exerted on the string lock screw or Hollow Point®/String Lock Screw assembly. Pushing down on the Hollow Point® to “stretch” the tension plate will usually allow easier rotational movement of the Hollow Point®. Problem: My question is not answered here. Solution: Email us at support @ blackcherryusa .com (no spaces) or call us at the number below. Black Cherry USA is a company that specializes in offering products designed to improve or enhance musical instruments.